Sunday June 24th, 2018 - Saturday June 30th, 2018. Information Session Friday February 9th 6pm. Email gina@yogahara.com.au to come along, or click here. 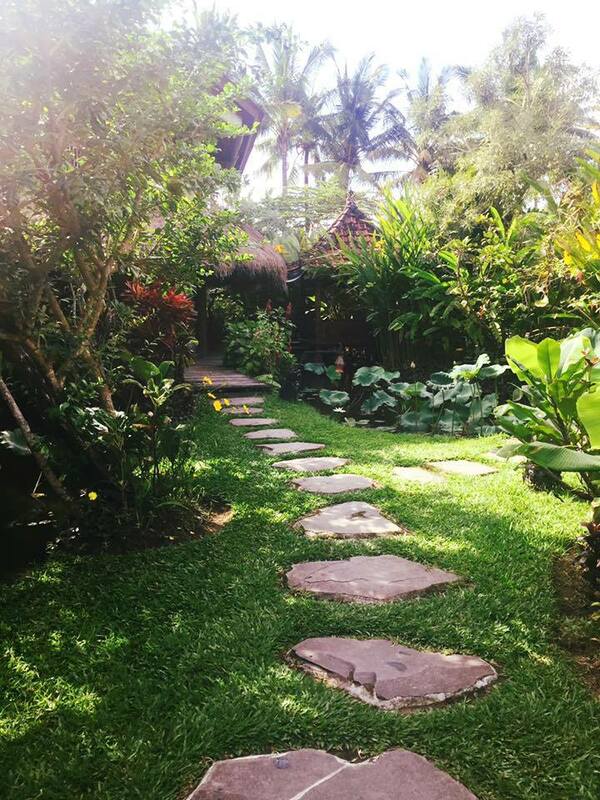 I would love for you to join me for a nourishing retreat in gorgeous Ubud, Bali. Bali is rich in culture and history and Ubud is it's centre of peace and tranquility. The food is simply amazing, nourishing and plentiful. You can indulge in a massage or body treatment at any number of spas. There are rice paddy walks, and cooking classes, markets and temples to get lost in. The week will be a lovely balance of yoga and time to explore. Retreat will begin at 4pm on the 24th and finish at 10am on the 30th. One day will be a free day after 9am. Retreat price includes: All teachings, accommodation and breakfast as well as airport transfers from Denpasar to Ubud and then out to Dragonfly Retreat on the 24th (a 800 metre walk through the rice fields from the road). Not included: travel to/from Bali, lunch or dinner, transfers from Ubud to Denpasar on the 30th. Note: There are only 5 rooms that can be single/double/twin share. So, if you want a single room, you need to get in quickly and if you want to share with just one person (twin or double) then also get in quick. The remaining rooms are shared with 3 or 4 people. They are spacious and private with partitions. Save $100 off these prices if paid in full by February 15th, 2018. Accommodation is at Dragonfly Village and is either single, or shared with 2 or 3 people. All rooms have ensuites. A non refundable deposit of $300 is required at the time of booking to secure your place. Balance is due by April 4th, 2018. If balanced paid by February 15th, 2018 an early bird discount of $100 applies. For more information please call Gina on 0419 328 054. Bookings can be made by e-mailing Gina on gina@yogahara.com.au, include accommodation type and if sharing, who you are sharing with. There are limited spaces, so please book in early (and take advantage of the discount) if you want to come. We have had more expressions on interest than spaces available. To enter Indonesia your passport must be valid for 6 months from the day of arrival. The Indonesian Government allows visa-free short visits (30 days) for Australians travelling to Indonesia. For more information on Visas or longer stays or for general information on travel to Indonesia please visit the Smart Traveller website. There are often travel alerts for Bali, so please check on this. You will be flying into Denpasar on Bali and Ubud is about a 90 minute drive from the airport. There will be someone waiting for you at the airport with a sign to take you directly to Dragonfly. A direct flight is about 6 hours. Jetstar has a direct flight to Bali leaving at 9.15am and arriving at 1.15pm (very civilised at both ends). Non direct flights are longer and sometimes cheaper. The currency is Indonesian Rupiah and you can exchange money at the airport in Australia or Denpasar (which is cheaper) when you arrive. I usually get a little bit in Australia just so I have some when I arrive and get the rest when I get to Denpasar. I strongly recommend having full travel insurance. This came in very handy for me a couple of years ago when a retreat I was attending was cancelled due to the volcano ash preventing us getting into Bali. The retreat centre will not refund our money based on us not being able to get there. Please have travel insurance. Your deposit is non refundable. If you cancel before April 4th, 2018 we can refund the fee less $300 deposit. If you cancel after April 4th, 2108 a refund may only available if your space can be filled from the waiting list. For more photos and info on Dragonfly Village visit their website or Facebook page. Gina has been practicing Yoga since the late 80s and teaching since 2009. She is passionate about Yoga and sharing her passion with those around her. She believes Yoga should be a fun exploration of your own body, breath and mind and encourages her students to find within themselves their own deep. She has attended many retreat in Bali herself and is looking forward to leading her first.